at the only lakeside accommodations available in the Grand Teton National Park. Enjoy the comforts of home and experience absolute relaxation in a 2-bedroom rustic log cabin with two double beds, another double bed, twin bed or two twin beds, a full bath, and porch. *Please note that all park accommodations are non-smoking and reflect the natural surroundings of the area; televisions, radios, and air conditioning are not available. 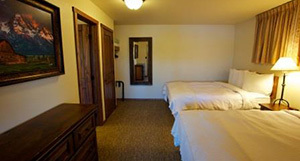 * Your resort in the Grand Tetons boasts several family activities, including guided tours, water sports, horse back riding and two amazing restaurants. CHUCK WAGON COOKOUT & WESTERN SHOW will bring you back to the 1800’s as you climb aboard a horse-drawn covered wagon and ride to an outdoor dining room on the bank of a clear mountain stream in beautiful Cache Creek Canyon. Your dinner includes roast beef, barbecued chicken, corn on the cob, Dutch oven baked beans, green salad, rolls, coffee, lemonade and brownies. Top off your evening whoopin’ it up with the singing Cowboys, Indians and Mountain Man. 2-HOUR HORSEBACK TRAIL RIDE Saddle up at a Top Notch Wyoming Guest Ranch, just outside of Cody, boasting thousands of acres of riding access. 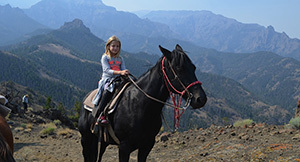 Horse back is the oldest and best way to see the majestic beauty of the Shoshone National Forest, as you ride through beautiful Alpine meadows and dense forests, through clear streams and over high country vistas. Wildlife sightings range from chipmunks and squirrels to moose, elk, deer, bear or stray buffalo. The horses and cowboys are very familiar with the terrain and well trained and have taken thousands of rides over hundreds of miles. 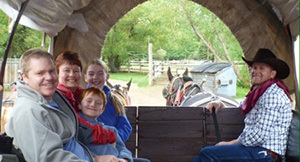 Rides are small and intimate, to provide each guest with memories that will last a lifetime. PROFESSIONAL RODEO TICKETS Experience a truly Western event that has its roots in ranch contests and games as well as spectacle and drama borrowed from the world famous Buffalo Bill Wild West shows. Hold on and enjoy as the cowboys and cowgirls go from calf ropin’ to full on bull ridin’ and see why Cody is known as the Rodeo Capital of the World. Your tickets are general admission, so you have the opportunity to sit in the Buzzard Roost – right above the bucking chutes! 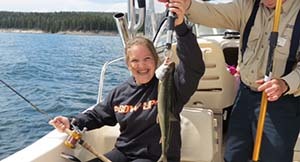 2-HOUR GUIDED FISHING TRIP Yellowstone Lake is the largest freshwater lake above 7,000 feet in North America and is home to native Cutthroat Trout and the exotic Lake Trout. Your fishing trip leaves from the Bridge Bay Marina in a 22′ Grady White and includes an experienced fishing and/or tour guide, fishing gear (rods and tackle), life jackets for each person, gas, and fish cleaning upon request. While on the water, passengers are not only fishing, but also treated to history of the area, while watching for eagles, ospreys, and such shoreline wanderers as waterfowl, and occasional elk and bison. Maximum of 6 passengers.